Golden does not need to blaze a trail into the frontier of riverfront development. There are many pioneer communities that have come to this same situation in the past and succeeded. This section is dedicated to sharing some of the lessons learned. "In addition to incorporating specific elements into community planning frameworks, in order to develop a vibrant and attractive waterfront, key best practices should be kept on the forefront of decision makers' minds. Focus on the public realm and urban design - guidelines relating to various elements of the public realm, including streets and plazas, signage and public art"
A fall 2016 article in Kootenay Business magazine outlines some of the challenges and plans for the Town of Golden, who "has been designated by the province as the diking authority." ‘We will ever strive for the ideals and sacred things of the city, both alone and with many. We will unceasingly seek to quicken the sense of public duty. We will transmit this city, not only not less, but greater and more beautiful than it was transmitted to us.' – Athenian Oath"
encourage ongoing regeneration of the riverfront. 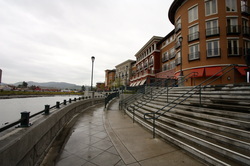 Riverfront planning is closely connected to parks, trails and recreation planning. A report by Mehak and Marshall, Elevating Parks, Trails and Recreation in Official Plans (2013), looks at the historical context and research evidence, and current policy and practice (Communication between Planning and Parks and Recreation), as well as propositions for the integration of parks and recreation into public policy" (www.LIN.ca, 2013). Better practices of riverfront planning are found around the world and they all take their local geography, hydrology, community and culture into account. While many of these examples are found in much larger communities, Golden has the opportunity, and one could argue, the necessity, to reap the potential benefits that specialized riverfront planning could bring. It is also important not to get bogged down with the scale of the examples, but rather use them for inspiration when thinking about Golden-sized interpretations. 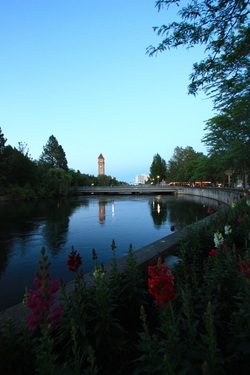 Starting with the lead up to the World's Fair, Spokane has been developing its waterfront for decades and is now a local and regional tourist destination with 12 themes. From a gigantic Radio Flyer wagon and slide, to amusement park, gardens, clock tower, pulsed gondola and shops, Spokane's riverfront is constantly evolving, attracting visitors and residents. 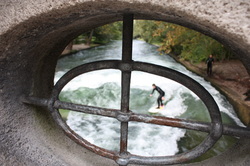 This 'standing' wave creates a natural place for surfers to drop in and ride as long as they wish. 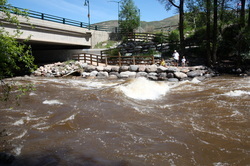 Situated just down stream from a bridge, there are often crowds watching the riders taking turns. 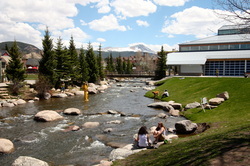 with walking paths, shaded riverside seating, !and picnic areas all surrounded by world class whitewater that has already hosted major national competitions. " - RFP's Preliminary Design Report, 2009. Founded in 1968, the Paseo del Rio Association is a non-profit organization created to "promote, protect and preserve the San Antonio River Walk, the number one tourist attraction in Texas. The Association accomplishes this through the production of special events along the River Walk throughout the year and through the publication of Rio Magazine, a monthly visitor magazine. The Association serves as an advocate, facilitator, and moderator among the business, civic, and governmental communities on matters concerning the River Walk." - The San Antonio River Walk website, 2013. Above Photos: These images were collected from the above mentioned 'better practice' riverfront communities around the world, including Spokane, WA; Napa, CA; and Munich, Germany.